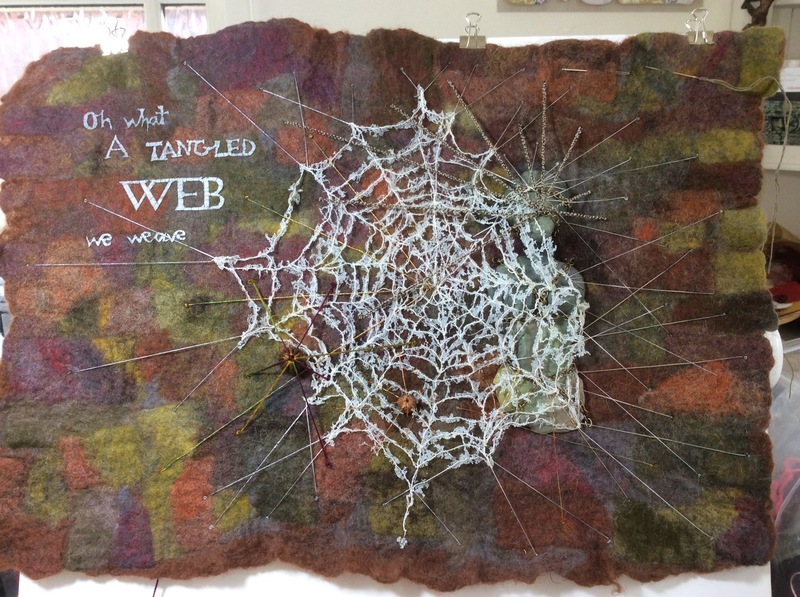 Our latest challenge at the Cranwell contemporary textile group has been to produce a piece of work based on a poem. 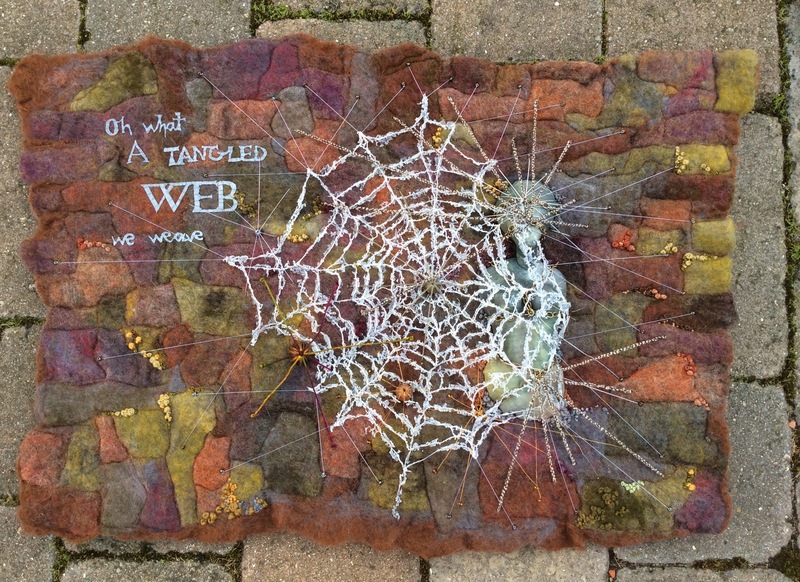 We could use any poem, any style and any techniques, but the finished piece had to be 20″ x 15″, quilted, and it had to include lettering in some form or other. 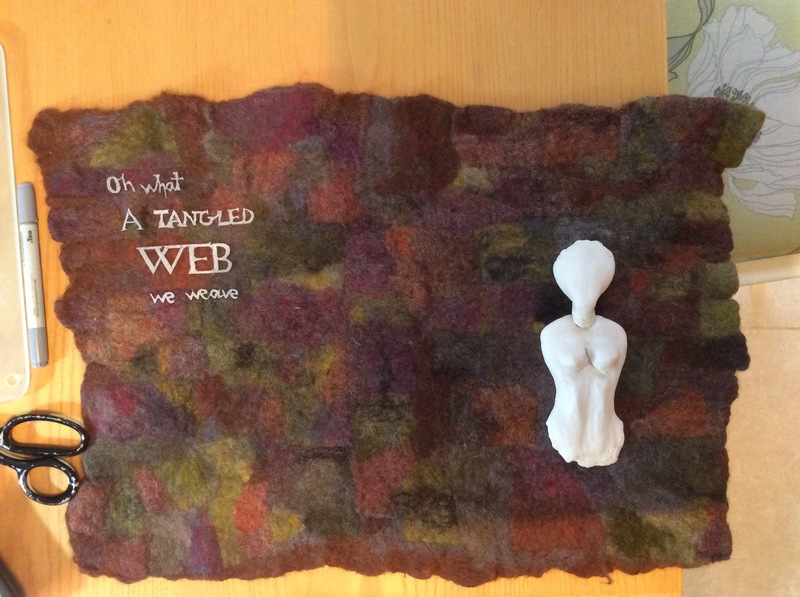 With such a “loose” brief the first thing I decided on was that, whatever poem I chose, I would use wet felting and my finished piece would be very textural. I sat down with my sketch book and thought through some of the odd lines I knew from well known poems. 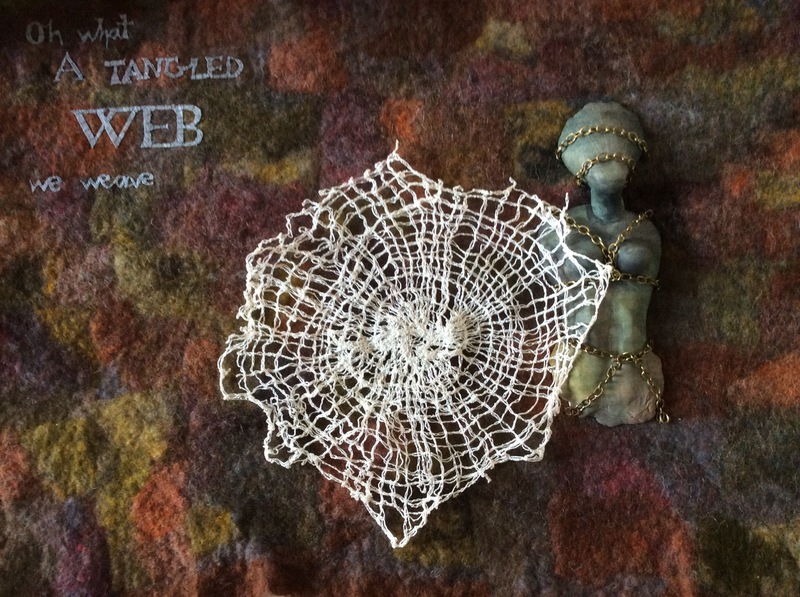 Nothing lept out to inspire me until the words “Oh what a tangled web we weave, when first we practise to deceive” came into my head. I didn’t know who the poet was or which poem it came from but a quick search on Google told me it was from an epic written in 1808 by Sir Walter Scott entitled Marmion: A Tale of Flodden Field. I know very little about poetry but this surely has to be one of the longest poems ever written! It took me longer to read the poem than it did to make the quilt! You can read a potted version of the plot on Wiki, but basically it’s a story in which good triumphs over evil. One of the characters is a “fallen” nun called Constance who is condemned to death for her misdeeds and walled up alive on Lindisfarne. It was the fate of Constance which inspired my design. 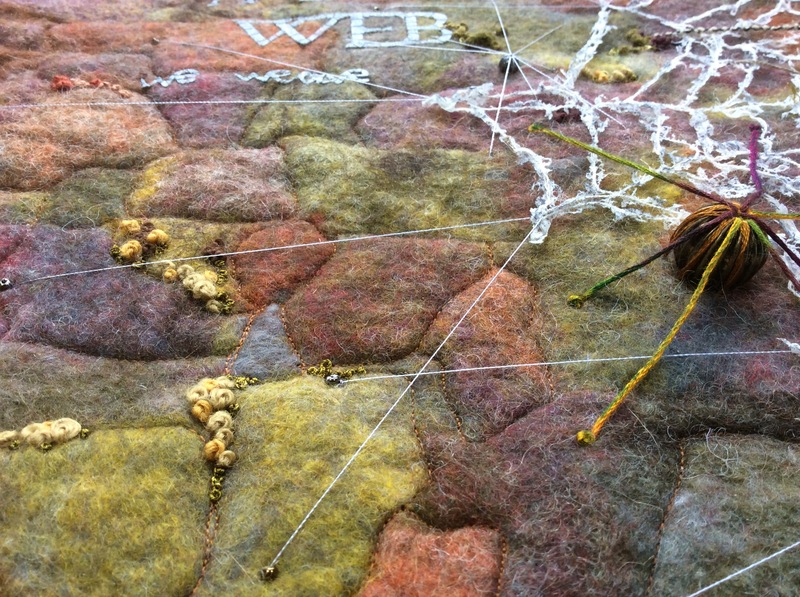 Using Merino wool, the background colours were laid out and wet felted to prefelt stage, then cut into smaller pieces, relaid and felted thoroughly. This technique is one I particularly like and the one I used in memories of a Greek holiday. 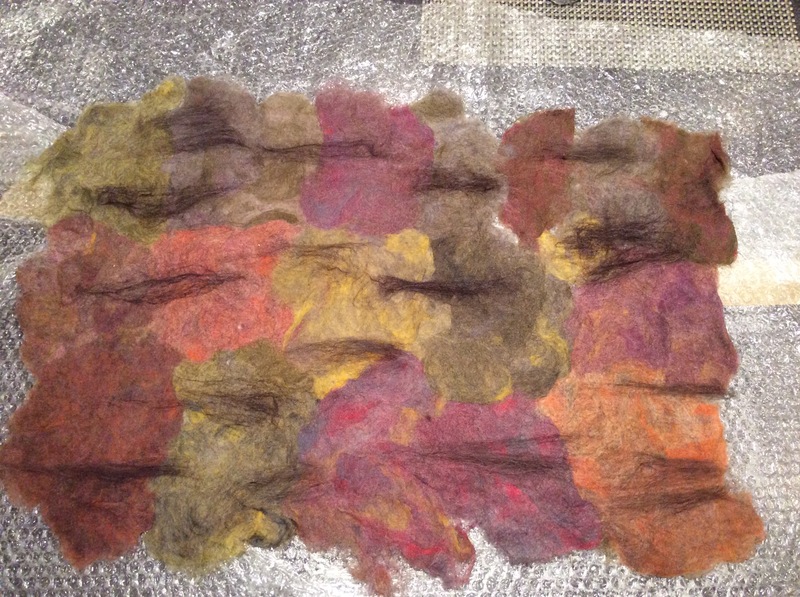 Carded Merino is wet felted for the background. Constance’s head and torso were made from air dry clay and later painted with Inktense. The lettering was cut from Lutradur using a soldering iron and coloured with a permanent marker pen. 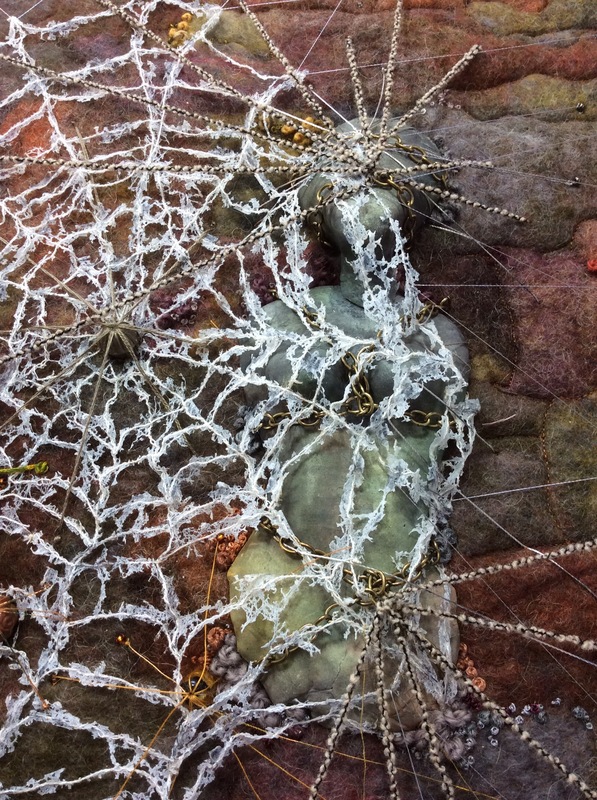 The first attempt at making a web was done with free machine embroidery on a soluable fabric and resulted in something that looked more like a fishermans net! The second attempt was more successful using free machine stitching on Lutradur and burning it away with my heat gun. The background has been free machine stitched and hand embroidered with Colonial Knots. Just came here from Working to Live and find I need to stay! Love the web. I know I talked to someone at K+S who said they were in Cranwell contemporary textile group, but as it is with talking to people at K+S, I can’t remember who! Lovely to hear from you Sandy. It’s great when someone new, with similar interests, finds your blog and then you get to discover their work too. Loving your site! I love the effect you achieved with stitching on lutrador and burning it away, I will have to remember that , the tattered effect is lovely. It’s a really versatile product to play with, you will love it if you give it a go!